See what's inside the latest issue of Paint & Draw, on sale now. Our lead feature though is a workshop by artist Tony Underhill. With his advice for using inks and watercolours, your artwork will soon start bringing the outdoors in. Thanks to his tips, you'll also get a better understanding of how the two mediums can work together for maximum impact. Issue 12 also includes the first part of a new series dedicated to pencil drawing. Our readers have been calling out for this so we're happy to deliver. In these workshops you'll learn the essentials of how to draw with pencils, from tips on how to hold them, to different ways you can use them to make marks. 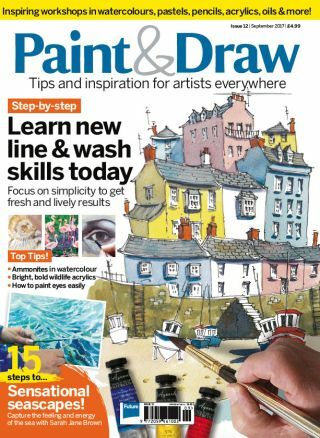 Of course, the latest issue also comes with all the news, reviews and exhibition previews you've come to expect from Paint & Draw, so make sure you don't miss it. Some more of the magazine's highlights are below. Make your artwork stand out from the crowd with these composition tips from Marie Antoniou. With her tips for painting colours and patterns, you're sure to start giving your artwork something extra special. Eyes are the most important part of any successful portrait, so it's important that you get them right. With these quick tips you'll get a better grasp of the anatomy of eyes so that your faces look more lifelike than ever.